Before we learn the meaning of the idiom cut the mustard, lets first look at the meaning of the word mustard. Typically, we know mustard as a spicy yellow or brownish-yellow sauce that is usually eaten with meat or used in certain food recipes. It is made from the seeds of a mustard plant. Fast food such as hamburgers and hot dogs are often served with what is supposed to be mustard but is in fact just a tangy yellow sauce which looks like mustard. For a more in depth look at the word mustard click here. The word mustard is used in several English idiomatic expressions and is also used as a (mainly British) slang term with several different meanings. For example, mustard can mean money. i.e. My girlfriend left me because I don’t earn enough mustard! It can also be used to replace the word good. i.e. I saw the new James Bond film last night. Oh it was mustard, mate……..real mustard! Click here for more meanings and examples from urbandictionary.com. One of the idiomatic expressions is keen as mustard, which means very enthusiastic. i.e. Sophie was as keen as mustard to go to Hong Kong and study English. 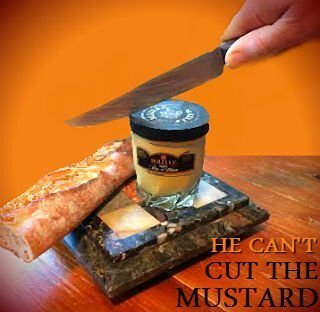 Another common English expression is to cut the mustard. To find out the meaning of this one, watch the video below to see Richards Ford’s excellent explanation and example. ← Chinese Table Manners – How Well Do You Know Chinese Dining Etiquette?